How long will it take Apple Podcasts to get my new episode? 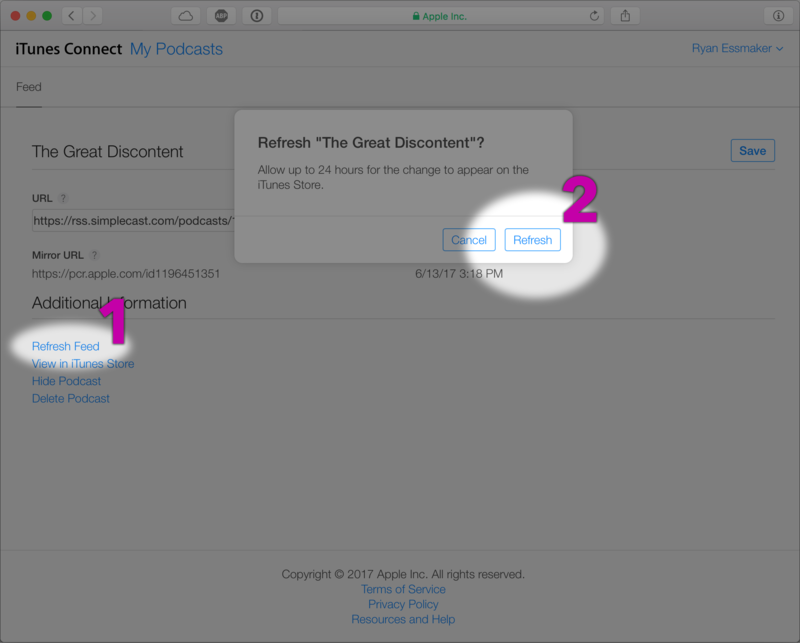 Once you've provided Apple with your show's RSS feed URL, any updates or new episodes should appear quickly for your subscribers in iTunes or the Apple Podcasts app. However, at times Apple may take up to 24 hours to check your RSS feed for new episodes. If updates or new episodes are not showing within 12-24 hours, you can visit your Podcast Connect dashboard to request a manual refresh of your RSS feed (see example screenshot below). If you haven't yet submitted your show feed to Apple Podcasts yet, click here. If you have any questions about your podcast on Apple Podcasts, please contact Apple. Still have questions? We'd be happy to answer them. You can start a live chat with someone from our support team by clicking the chat icon in the bottom-right corner of this page.